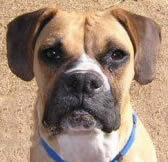 How do I contact Boxer Rescue of Albuquerque? I really want a puppy. Do you have puppies available for adoption? Do you normally have Boxers available for adoption? Can I request a specific gender, color or age? Do you need volunteers to foster Boxers looking for permanent homes? 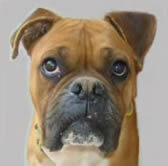 How do I adopt from Boxer Rescue of Albuquerque? Will my newly adopted Boxer be healthy? I live in an apartment. Can I adopt? I am in the military. Can I adopt? Our contact info is on the contact page. You can also fill out and submit the Adoption Form. Please keep in mind that we are all volunteers and there will be some delay in getting back to you. How big will that puppy be? What kind of temperament will he have? Will he be easily trained? Will he have a good personality? How active will he be? Will I get much sleep? When adopting an older dog from a rescue, all of these questions are easily answered. We normally have Boxers, but sometimes they may not be immediately available. Occasionally we may need to treat a medical condition or schedule spay/neuter or other surgery. 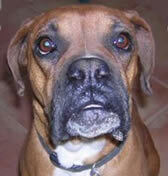 We also have a number of contacts to locate Boxers around the state of New Mexico. You may request a specific gender, color or age. However, the more specific you are, the longer it may take. So, as long as you are willing to be patient, we will definitely be on the lookout for you. It would also be helpful if you let us know if you find a wonderful pet before we locate one for you. We are always in need of foster homes. 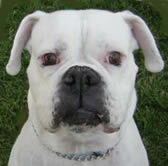 Occasionally, we will have several Boxers with medical needs and do not have available foster homes. We would also welcome foster homes outside of the Albuquerque area. If you are interested please contact us by email, thanks! We welcome any monetary contributions and all donations are tax deductible. We also accept equipment, such as leashes and collars. Dog food, canned or dry, would be wonderful! Begin by completing the adoption form. Dogs that are under 6 months old are $330, between 6 months and one year are $250 and one year and older are normally $150.00. 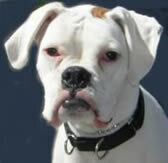 We do have situations where the dog may be older and/or may need long term care or has received extensive medical care. In these cases we may need to adjust the cost accordingly. Of course we will seldom know the medical history of any Boxer that we receive either through surrender or a shelter stray. We will always treat immediate medical needs which have been identified by qualified veterinarians. We also attempt to obtain all of the appropriate shots and test the dog for heartworm prior to adoption. We do not normally place dogs in apartments or homes without fenced yards. But we have made exceptions. If you are going to exercise your new boxer every day for an hour or more, we would like to see if there is a match for you. We would love to help you find your lifelong companion. All we ask is that you consider the possibility of being stationed where you might be required to surrender the dog. If you feel that this might be the case, I would encourage you to become a foster home for our rescued friends.